Creating raised bed gardens involves choosing the best materials possible for them. When choosing your materials I must say that it’s very important to keep in mind the climate you live in along with your budget. I noticed recently that there were lots of upgrades in commercial raised garden kits along with the establishment of some new organic gardening standards. The good thing about this is that you can have a lot of good quality options to create the best garden whether it’s a raised bed or not. I’m going to offer you 3 types of building materials that I know of for building raised bed gardens. These materials will fit well in any situation. If you’re looking to build permanent raised beds, then these materials are the ideal fit. These construction bricks come with a lot of varieties of sizes and colors. The two things that need to be thought out carefully are the cost and weight of these materials. creating permanent well designed structures that can also enhance the appearance of your property. The planting beds will retain some warmth that’s essential for the plants. A disadvantage with living in a climate with severe winter is that “frost heave” can become a problem for hand-built raised beds. “Frost heave” is where ice forms beneath the surface of the soil. To protect your garden from frost heave, mulch the soil to aid with changes in the temperature and to also help decrease frost penetration. If you live in a moderate climate and you’re looking to cut cost, outdoor lumber is an excellent choice for you. Treated outdoor lumber should be avoided as it contains chemicals that do not match agricultural standards. Raised beds built with normal lumber that’s about 2 inches or thicker will last at least 5 years. It all depends on the climate you live in. The beds may need to be replaced earlier than 5 years if you live in a very cold or humid climate. This is a relatively new material that’s a combination of wood waste and plastic. They are designed into standard-sized boards. What I like about them is that you can save energy by using power tools when cutting lengths. Plastic boards are a safe and healthy choice as they meet international organic gardening standards. They’re excellent for vegetable gardening in raised beds and even though they’re more costly than lumber, the good news is that there are tons of sizes to choose from. Their prices are also becoming quite reasonable as time progresses. I must mention too that they last pretty long in all climates. Having raised bed gardens allows you to be flexible when designing them as you can design them any way you want. It encourages you to be on the creative side. Materials come with a lot of varieties such as stone, wood and brick. Consider what size you want your raised bed to be. For example, if you’ll like to have a big bed or a bunch of small ones. Think about how you’ll like your bed to be placed in your yard and all the tools you’ll need for accessibility. A high bed will be more suitable for an elderly or disabled gardener. Ensure that the pathways are spacious enough to accommodate easy accessibility through the use of garden tools such as wheelbarrows. When you’re ready to choose materials for framing your veggie beds, consider which ones will blend in well with your garden landscape. Wood is a popular choice by many gardeners. After all, wood is classy to look at. For a nice classy looking appearance, you can use logs or railroad ties. For a well-finished look, lumber is the right deal. Stone is perfect to use to create a well-designed frame around your garden. Stone and concrete tend to be better choices than wood as they last longer. Concrete - blocks can be used for decoration and are quite reasonable in price. You can find them at any home and garden center. Pressure treated lumber lasts very long. They’re a better choice than wood as untreated wood tend to rot over time. You can still use untreated wood if you want as it’s safer to use. Opt for a more rot-resistant type like cedar or redwood. If you’re using wood, it doesn’t matter what type it is as it will need to be supported with steel pipe or stakes to maintain the shape of the bed. You can even consider using old tires for raised beds as well. 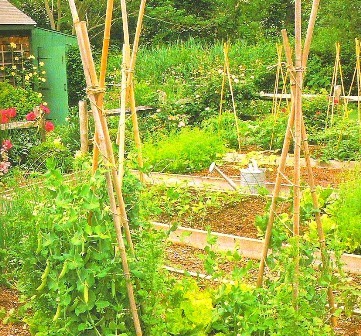 This method is very popular now as I see a lot of people have it their garden. Not only is this method cost free but it’s also a great recycling idea to try out. These are some of the materials that can be used to create some really lovely raised bed gardens. There are tons to choose from and these guidelines should help you make the best decision possible for your raised bed gardens.